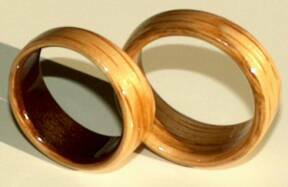 Designed for a couple in England, these Oak Wood Wedding bands were both tapered. Hers has a Cherry interior. His ring is a size 8 and is 10mm wide at the front, hers is size 6 1/4 and is 8mm wide.